Thirty-four years is a long time to do anything but David Tamulevich and Michael Hough, who have been singing together since 1974, still look forward to their next memorable musical moment with youthful enthusiasm. They discovered their mutual love of folk music while working as cooks at the Brown Jug Cafe in Ann Arbor, Michigan, where both attended the University of Michigan. Both loved folk’s social nature and the warmth of the community built around it and figured, “Why not give it a shot?” They worked up three songs to perform together at the nearby Ark Coffeehouse. “It was a good combination,” Tamulevich said. “I was so impressed by Michael’s exuberance and love of performing.” Soon afterwards, they were full-time performers, playing bookstores, colleges, concerts and pubs. They took their name from “Mustard’s Retreat,” an early song written after local performer Nancy Mustard taught Tamulevich a slide guitar chord he turned into an instrumental composition. The Ark Coffeehouse is featured heavily on their latest CD, “There... and Back Again: Snapshots from Life on the Road” (Yellow Room Records), a collection of live recordings made between 1986 and 2005 at coffeehouse and radio stations. The live format captures aspects of their music you might not catch in a studio recording, from the delicate sound of their guitar strings or the heartfelt sound of Hough’s voice on “Handfasting.” The duo’s warm 1960s-like coffeehouse feel encourages you to sing, clap or stomp along. Mustard’s Retreat CD liner notes are like newsletters, little pieces of how a song came together, how it was recorded or enough background on the person who wrote it to send you off in search of more of their music. The live disc includes compositions by David Bromberg, Huddie Ledbetter, Steve Gillette and Tom Campbell and a song Tamulevich co-wrote with Garnet Rogers. 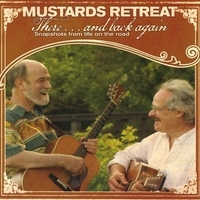 Mustard Retreat’s previous release, the studio recorded “MR7,” features a warm sound and heart-tugging images, some about good times, others about relationships since faded, and a few hitting right at current events – even if they had been written 30 years ago. “Here Comes the Snow” deals with the genuine human aspects of the ups and downs of relationships, as opposed to the fantasized version usually put forth in pop music. Meanwhile, “(I’m Singing) State of Mind” feature lyrics like “Lord, I hate mosquitoes. Black flies are even worse. The flies of Lake Superior are the very Devil’s curse/ but when you take the bitter, and you mix it with the sweet/ down she goes like a can of Stroh’s, and Lord it can’t be beat” send you back to your fondest campground memories. “You’re sharing your experiences, good and bad,” Tamulevich said. “We’re telling stories in all our lives and find the common ground where one plus one equal three. We go across the spectrum of the human experience, from the ridiculous to the heartbreaking.” All originate in real experiences. Tamulevich wasn’t sure who might join Mustard’s Retreat onstage at the Nashua River Valley Folk Festival on August 10 at the Pierce Homestead in Lancaster. “It depends on who’s there,” he said. “Susan Werner knows some of our stuff. Gandalf Murphy & the Slambovian Circus of Dreams are there and we’ve played with them. It depends what we have time to go over.